Rebibo, Janice Silverman. 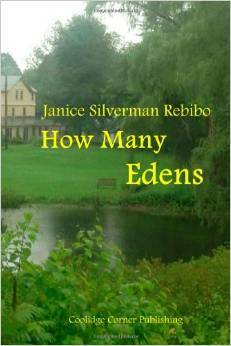 “How Many Edens”, Coolidge Corner Publishing, 2014. I am rarely at a loss for words but this time I am. I have been reading and rereading Janice Rebibo’s new chap book and it has really affected me. It does not happen often that I read a book that hits me emotionally like this did and just the title sent me into reveries. If you use the Hebrew Bible’s definition of Eden, we then speak of paradise, a place where everything is perfect as are the people are these. Eden as the Garden of Eden usually is at the top of many wish lists—we want our lives to be perfect like Eden and yet we forget that we have had Edens in the past but lost them rendering us to be somewhere “East of Eden” as Cain was forced to live. My father used to tell me, “We strive for perfection, but we must learn to make peace with mediocrity” and in many cases this is how we live. But I have also reached the conclusion after reading Rebibo’s poems that Eden does not have to be perfect—we merely need to acknowledge as Eden. Rebibo’s new chapbook consists of 15 poems (or 12 with one being made up of three shorter poems) and each takes us to Eden in some form). The poems form a cycle in which several of the poems have biblical and/or rabbinic references. These come from the book of Genesis and since I have spent many hours on interpreting the Akeda [Genesis 22] (the sacrifice of Isaac), I was immediately drawn to “Longing and Loathing”. I was also reminded here not only of the reference to Kierkegaard’s interpretation of the event but also of the very thin line that exists between the two feelings of longing and loathing, desire and repulsion, love and hate. I understand from reading the entire cycle that Paradise or Eden is where we are now but we just might not know or see it. I believe, like the poet, that where we are now is holy and we just need to accept that. If we carefully examine where we are (as Rebibo tells us) and that we are where we are meant to be and since where we are is holy, we are indeed in Eden. This Eden is a garden and the flowers represent our lives and what we have done with them. It is our responsibility to concentrate on our Eden and what is in it, “This allows us to concentrate on what is within…”—we need not worry about what is outside of Eden, our local world, the one we inhabit and realize that not all is perfect and it is up to us to try to make it so. Rebibo also writes about Adam as she sees him—not nearly as splendid as his garden. He is like us—trying to reach that state where all is good. Something makes me want to analyze each poem here but it doing so, I would project my feelings onto other readers and I dare not. Whereas in the Bible, we were given Eden, in real life we have to find it and then acknowledge that it is Eden. Unfortunately, most feel that there is always something better somewhere else and the grass on someone else’s lawn is always greener. This is not the message we get here. So now I can sit back and relax in my own Eden and once again think about the poems which means that this review is simply a reflection of how I felt as I wrote it. This entry was posted in Judaica on May 27, 2014 by Amos.